How many of you remember Tomato Aspic? It was the “fancy” congealed tomato salad that all the ladies in town made for their garden club years ago. I’m sure it made regular appearances at church potluck dinners as well. It was certainly popular in my hometown of Aberdeen Mississippi. My parents gave me a copy of Prime Meridian cookbook for Christmas which features the recipes of Meridian, Mississippi. 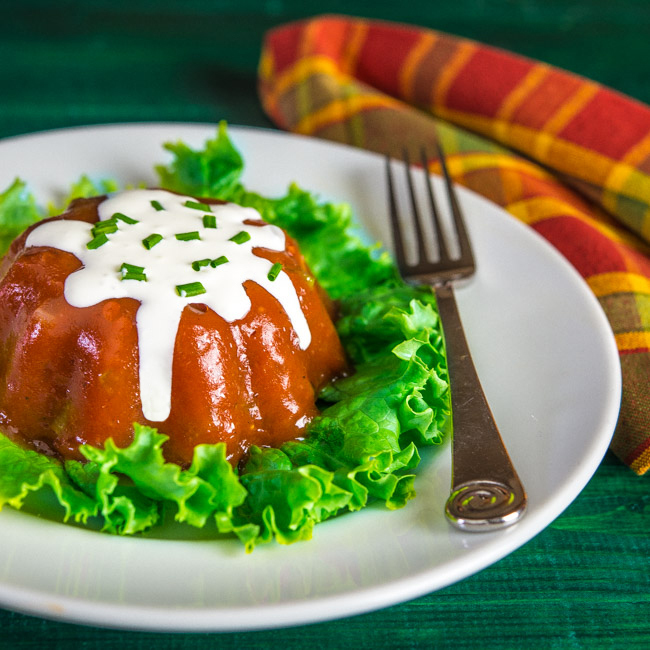 Tomato Aspic occupies a prominent place in the salad section of the book. As I thumbed through the book, I was flooded with memories of my childhood. Since I was old enough to sit at the table, I’ve been a food enthusiast. Food always conjures memories of significant times or events in my life. Thinking about Tomato Aspic, a food that I wasn’t particularly fond of at the time, transported me back to a day where Jello and congealed salads were all the rage. My grandmother always made a Ribbon Salad for Christmas. This salad had a layer of sweet cream cheese filling between layers of red and green Jello. I haven’t had it in many, many years, but I’m sure I would still love it because it would remind me of my Grandma. I haven’t heard about or tasted Tomato Aspic in years, with one exception. I had a extraordinary Christmas Eve dinner several years ago at the restaurant of acclaimed chef, Guenter Seeger. The prix fixe dinner included an appetizer of tomato aspic. I don’t recall details of the dish, but I do remember that it was white and had a very intense tomato flavor. I never figured out how they removed the red color. For today’s post, I’ve made the Prime Meridian version of Tomato Aspic, as a throwback to food trends of yesteryear. I gave it a bit of an update by adding crème fraîche and chives. As I mentioned before I wasn’t fond of it as a child, but the addition of the crème combined well with the bite of the tomato flavor, and my adult taste buds approved. I’m now a fan of this retro salad. 1. Dissolve gelatin in hot water. Add tomato juice, lemon juice, Worcestershire sauce, Tabasco sauce, onion, celery, salt, and pepper. Mix well. 2. Brush the inside of 4 to 6 ramekins with vegetable oil. Fill ramekins with mixture and refrigerate for several hours until firm. 3. To serve, unmold and place on lettuce leaves. If needed, dip the ramkins in warm water to loosen. Spoon crème fraîche over aspic and garnish with chives. I know I’m late to the party here but I was searching for this recipe and found your website. I’m so glad I did! My meemaw used to make this or something similar for various social functions and holiday dinners. I,too,was not a fan of tomato and jello combinations, because in my simple mind jello is supposed to be sweet and if anything is suspended in the middle of it, it should be fruit. Now I’m a 40 something adult who misses her meemaw and her meemaw’s cooking and I try to replace the void she left in my life with cooking and consuming the food she cooked. Thank you for this recipe! Peace and love. Looks pretty. I want to make this with Thanksgiving dinner. I wonder if it will go good with turkey? Hi Mary, thanks so much for dropping by. I think this would be a great “retro” addition to a Thanksgiving meal. Hope you enjoy it! I haven’t seen a tomato aspic in years. And I’ve made it — well, come to think about it, I’ve never made it! What a fun dish, and so nicely presented. Thanks! Great memories of tomato aspic and my mother’s friends. A beautifully presented southern classic. I don’t believe I’ve ever seen tomato aspic quite so lovely. Thank you so much, Sam! It was fun talking a walk down memory lane!